Sneaker trends to try for Spring. If there’s one shoe trend I totally approve of these days, it’s got to be the sneaker trend. It’s one of those trends that snuck up on me unawares while I was looking the other way a few seasons ago, and these days I practically live in sneakers 24/7. So here’s a quick post on the spring sneaker trends out there and how to style them for the season ahead. As with all trends, there’s a good side and a bad side to this one. Don’t even get me started on fugly dad sneakers – I just can’t go there. They are way outside my comfort zone… and did I mention the fugly part?? On the other hand, there are plenty of other sneaker cuties out there which pass muster via my stylist eye, and a pretty pastel or neutral hue is one of my top choices. You can pair these with pretty much anything from maxi dresses to dress down denim and a blazer. Once spring kicks in try wearing them with sugary pastel tones which are dropping in stores for the season ahead. Next up metallics are having a bit of a moment – think Stan Smiths with metallic details, Golden Goose in rose golds or good old Nike with metallic knit uppers which tick the trend box nicely without breaking the bank. You should also look out for mixed prints and patchwork fabrication – Valentino are always genius at this look but also check out high street stores for cheaper alternatives. Finally, velcro sneakers are making a come back. After years of shouting at my kids to do their laces up, I’m not sure I’m ready to regress to that level, but give me a couple of weeks, and I’m sure I’ll be jogging right alongside that bandwagon. If you’re not sure whether these sneaker trends are quite up your street, why not pop over to our Start Here pages to help figure out your Style ID. The sneaker trends… how to wear them. So how easy is it to segue those super comfy sneakers into your everyday wardrobe? The answer is pretty simple actually. Where once we were all about the bootie, now it’s sneaker-mania out there on the streets. 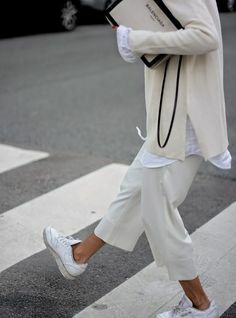 It’s quite acceptable to wear your sneakers to work with a skirt or a suit – Working Girl fans your moment is now. 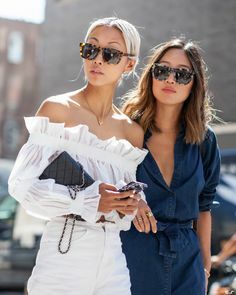 Whilst weekend ready looks include skinny jeans, slogan tees and tailored blazers paired with uber practical trainers, or wide leg crop pants, Breton tops and biker jackets paired with box-fresh Stan Smiths or Adidas Gazelles are a winner. 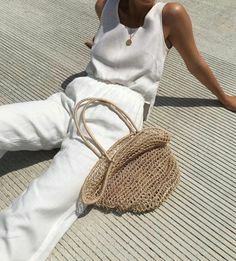 See above for some Pinterest inspo as well as an edit of some of my faves out there right now. Click the images to shop. #AffiliateLinks used. Previous Post Spring stripes for the new season. Next Post Can we wear leather leggings at 50 plus?